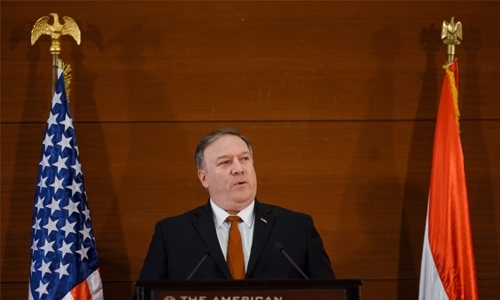 I hear cynics in Cairo and across the Arab world claiming that US Secretary of State Mike Pompeo’s Egypt speech was no more than a cheap attempt to please his boss by systematically attacking the central tenets of Barack Obama’s Middle East policies. Pompeo even delivered his speech from the same capital where Obama set out his own regional aspirations at the outset of his presidency. Advisers for both figures apparently believed that, by trashing previous US policies and telling the Arabs everything they wanted to hear, they could cheaply win over thousands of hearts and minds across the region. Yet the Arabs are a more skeptical and discerning audience than Washington gives them credit for. Arabs are already scratching their heads at daily American policy cartwheels over its withdrawal from Syria. Are they leaving and, if so, when? It has reached the farcical extent where it doesn’t even matter, because Washington has lost so much credibility that the Kurds, Turks, Iranians and others are already making their own calculations as if US troops had already left. John Bolton was last week sent home in disgrace from Ankara after yet another policy reversal prior to his arrival. Yet, with Bolton asserting that US forces were staying to eradicate Daesh, it was then officially announced that the formal withdrawal was already under way. This administration has mastered the art of the token gesture. Taking credit for comprehensive sanctions against Tehran, then walking away and forgetting all about the Iranian threat, with so many sanctions exceptions that oil prices have plunged amid Asian markets being awash with cheap Iranian oil. Likewise, with North Korea, Donald Trump gained kudos for his bellicose rhetoric, before announcing Kim Jong Un to be his best friend at a cursory meeting, then lurching on to other obsessions, leaving Pyongyang to enlarge its nuclear facilities unhindered. Trump and his foreign policy team have had two years to delineate an effective Middle Eastern strategy. Yet it is impossible to identify coherence and consistency in this administration’s activities towards any part of the region. Insiders are privately predicting that Jared Kushner’s vaunted Israel-Palestine peace plan may never see the light of day. Although Pompeo unforgivably ignored the Palestine issue in his speech, he enjoyed the applause for promising to “expel every last Iranian boot” from Syria. Fine words, but how will this be achieved by a US administration that found even the puny presence of 2,000 troops across the entirety of eastern Syria to be unsustainable? The US diplomatic corps, meanwhile, has been so thoroughly gutted that the White House often cannot find ambassadors for key posts. So let’s not kid ourselves that this administration possesses the capacity or willpower to implement a far-reaching strategy of containing Iran. Even if its commander-in-chief wasn’t inclined to wake in the morning and derail months of conscientious policy-making with a single tweet. Even if this wasn’t an administration that simply abandons its Arab, Kurdish and European allies on a whim.